Encyclopedia of Video Games has arrived! The long-anticipated (at least by me) Encyclopedia of Video Games: The Culture, Technology, and Art of Gaming has been published! I wrote a couple of entries (on biomechanics and gestural interfaces), and I am delighted to be included with friends and colleagues in what is sure to become an essential reference in the field. 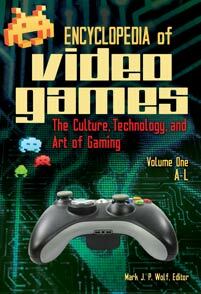 As the PR copy for the two-volume set attests, “Video games are far more significant to society than they may seem. They were the first form of interactive audiovisual multimedia, introduced consumers to computer technology, and were one of the main selling points for early home computers, launching the digital age for the general public.” Also: video games are fun. A special thanks to editor Mark J. P. Wolf for undertaking such a massive endeavor, and to John Underkoffler at Oblong for image permission. I’ve been playing the video game Saints Row: The Third (Volition/THQ, 2011), which hits the screen like a whippet-huffed version of Grand Theft Auto IV. To articulate this comparison in more technical terms: although the core mechanics and urban milieus of the games are similar, the aesthetics of SRTT and GTAIV engender different psychological affects in the player. GTAIV pairs the ludic struggle with a deadly serious protagonist (Niko Bellic), who metes out justice in the gritty alleys of Liberty City. SRTT, however, turns your gangsta loose in the neon, urban jungle of Steelport, stuffed in a bunny suit (if so inclined—this game has big closets) and wielding a giant, lethal phallus like a sword. It’s a Freudian field day. SRTT gleefully wallows in brash, crass, and absurd storylines and gameplay. And this is all for the good. Perhaps more games could juxtapose—as SRTT does with wild abandon—the ridiculous and the sublime, offering players the very excesses of hilariously bad taste and neck-snapping contradictions we (sensibly) would otherwise reject, and (hopefully) would never encounter in daily life in the first place. The “spoiler” claim has emerged in recent years as a curious symptom of modern-day media ubiquity. We want our iPhones, our digital clouds, and our on-demand instant access to everything. We want to be “first!” (a phrase some web-site readers go so far as to vapidly append to stories and blog posts). Except, of course, when we don’t.